The Cd case has a cameo on the front and is made of the same silk material, hand crafted and unique to A1 Photogenics. 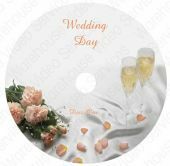 The CD's themselves will be printed with the following signs with the wording 'Our Wedding Day'. The following image, is of the preview album which holds 100 6"x 4" images.This is yours to keep. It is also made of the same silk material, hand crafted with a cameo image on the front. The following images are of the guest book. Used for people to sign and write their comments in at the evening reception.They are also made of silk and hand -made. They are 80-100 pages thick. And each page is printed with a heart design. On offer is also signing boards, a nice way for your guests to leave comments and be framed to go on the wall. The following images are of a 'Handbag' album and a 'Wallet ' album. They start with 24 pages and can go up to 150 pages. 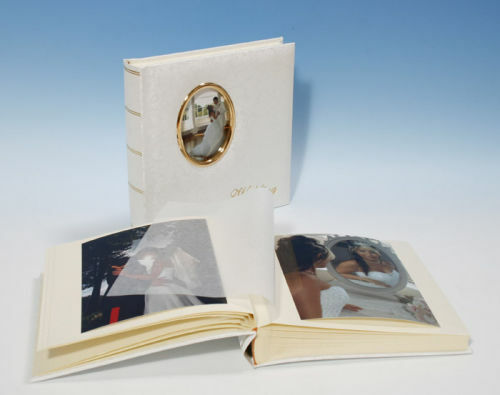 They comprise of one photo per page, printed directly on the page itself. And text can be added. 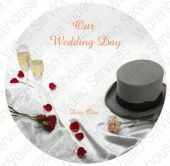 If it's just a USB stick you are looking for with all images on and print your own, then we offer a choice of 3. A heart shaped Jewel USB in a nice Presentation case. Or a Wooden one in a wooden box or a Glass one complete with 10 10" x 8" Mounts (5 Black & 5 White). All USB sticks come engraved with your names and date of wedding on. A 10" x 10" album. The Front is a hardened anti-scratch glass crystal effect cover. Available in four different colours of Black, White, Red and Brown. Rigid thick unbending pages, A lay flat design with seamless 2 page spreads so you photos won’t be chopped in half.